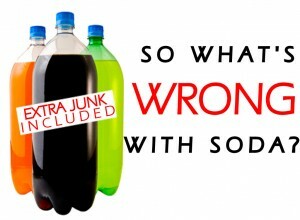 So What’s Wrong with Soda? Did you know that soda consumption among American children has increased by 500% in the last 50 years? It’s the biggest single source of sugar in the diet today. And after the age of 10, sodas are the most consumed beverage drunk daily—over water, milk or juice. One 12 ounce can of soda contains 9 teaspoons of sugar. That is equal to about 1/4 cup of sugar and the average American drinks about 2 cans a day, equally 1/2 cup of sugar and 300 calories of negative nutrition. Get out your measuring cup and put 1/2 cup of sugar in it. Would you give this to anyone you love for them to eat? The soda habit could push you a little closer to tooth decay (with all that sugar, you bet! 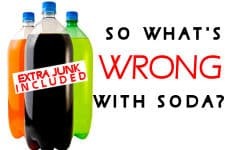 ), diabetes (ditto again on the sugar), osteoporosis (the phosphorus in soda leeches calcium from the bones), obesity (an extra 300 calories a day-2 sodas, will result in as much as a 30 pound a year weight gain!). Listen, Americans drink over 13 BILLION gallons of soda each year. Don’t you think it’s time we quit the soda habit and help take a million or so gallons of this stuff off the market so we can get healthier, leaner, stronger, have better teeth and prettier skin? Those are just some of the benefits by quitting the soda habit. 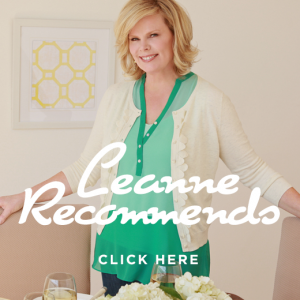 It’s time to drink up—make mine a water! Want to Break Free from sugar addiction? Here’s how!